These dark, brooding beauties will give your clients the blues (in a good way). Ultra Violet is the color the year and pink the latest to inspire a catchy pop song, but few hues have such universal appeal as blue. Maybe we love it because it’s the color of the sea and sky. Maybe we like its calming effect on our frantic mood swings. Maybe it makes us think about a certain sapphire engagement ring. Whatever the reason, blue is as popular as ever, and home furnishings companies are cashing in. From powder to electric, we’ve never met a blue we didn’t like, but there’s something especially intoxicating about the intense midnight and navy shades that are everywhere from fixtures to floorcoverings this year. Scroll down for a look at our favorite ways to give your clients’ interiors the (moody) blues. Out with the old (check ya later, damask and rose gold) and in with the blue: Marcel from Currey & Company is a fresh approach to neutral styling. 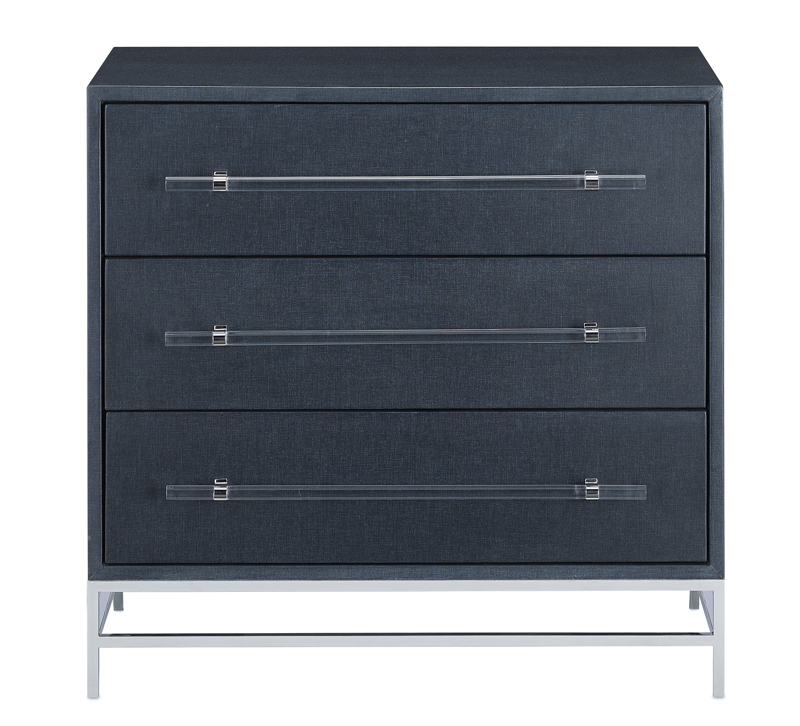 Covered in navy lacquered linen fabric with clear acrylic and polished nickel drawer pulls, this minimalistic yet elegant chest is an accent piece for rooms that need a little drama. 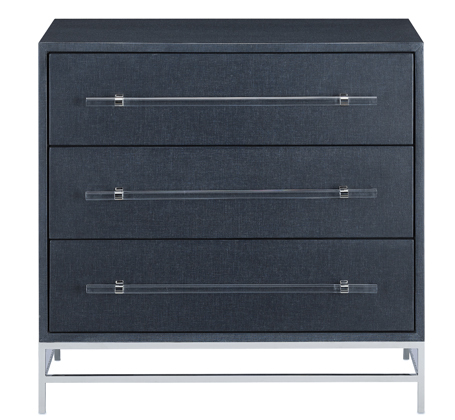 For a sophisticated pop of color, pair Marcel with a neutral pewter gray or tan palette with soft, luxurious texture. Elvis would have gladly taken a punch rather than have someone step on his blue suede shoes, but this similarly-hued rug from Capel just begs for foot traffic. Capital from Capel, shown here in a deep sapphire blue, features a traditional garden-inspired pattern with stylized blooms and foliage. 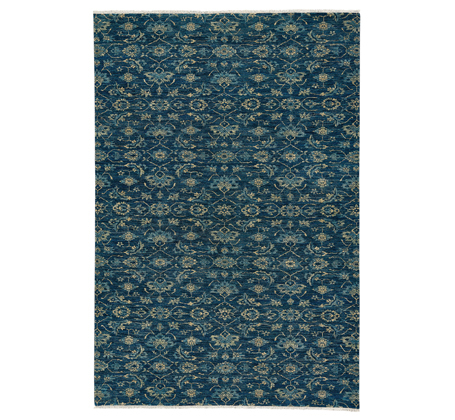 Arrange this stunning hand-knotted wool rug in a traditional sitting room alongside dark wood and gold decorative accessories. Add an intriguing focal point to your clients’ neutral white or gray living room. 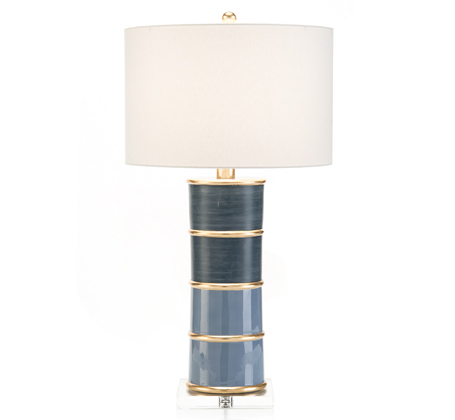 The perfect pop of color, the Pillar table lamp from John-Richard features bands of resin in varying shades of blues, dark to light. We love this lamp perched a top of console with sot white and gold accents. As an interior designer, your job often boils down to one thing: making your client feel like a queen (or a king). Luxe blue velvet is a great place to start. 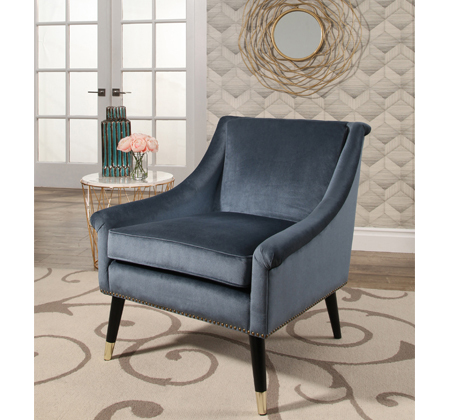 With it’s graceful lines, the Larsmont velvet swoop chair from Abbyson Living even looks like a throne. Pair this accent seat with dark wood and gold to enhance its royal appeal. 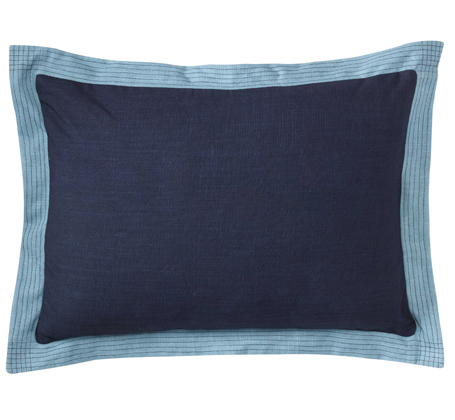 Move over popped collars, monograms and seersucker shorts, the Ainsley pillow from Company C in navy offers all the preppy attitude your clients need. Ainsley’s fresh monochrome aesthetic (with a contrasting banded border) makes it a versatile option for wherever you’re pushing the extra cushions. Style this eye-popping pillow with (equally preppy) crisp white upholstery. How do you do blue? Share with us below.